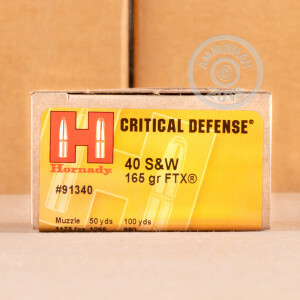 As your proven self defense leader, Hornady offers this 40 Smith & Wesson 165 grain Jacketed Hollow Point Flex Tip Technology ammunition! Be prepared for the unexpected with 20 Rounds of this reliable product. 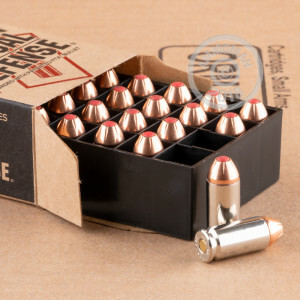 Designed especially for concealed carry/personal protection weapons, this Critical Defense line of ammunition will penetrate thin and heavy clothing with ease, including denim and leather. To take the Jacketed Hollow Point bullet even further, Hornady has created Flex Tip Technology where a soft tip compresses into the bullet upon impact for immediate expansion. Each cartridge is cased in nickel-plated brass allowing for a smooth feed into your pistol. As an added benefit, the light color and reflection of nickel allows you to see your ammunition better in the dark. These rounds are loaded with Boxer primers and clean burning powders, which will reduce the amount of carbon which builds up in your barrel. 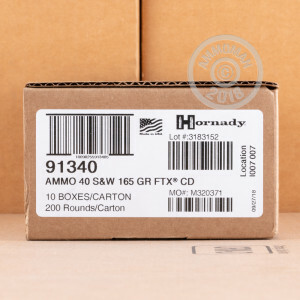 Hornady Manufacturing Company has been providing quality top-of-the-line ammunition to law enforcement officials, military, shooting and hunting enthusiasts since 1964. They are still family owned and operated in Grand Island, Nebraska today.